Santa Claus Conquers the Martians, one of the most charming of holiday motion pictures, is being re-released on a one-time-only basis to theaters across the United States and Canada this December. The film, which has been digitally restored, has not been seen on the big screen since its initial release in 1964. Santa Claus Conquers the Martians is the main feature of a delightfully retro compilation called SANTA'S COOL HOLIDAY FILM FESTIVAL, which features a family-friendly mix of vintage Technicolor Christmas cartoons, long-lost holiday greetings from Sixties TV personalities like Shari Lewis & Lambchop and Ozzie & Harriet, a 1949 bouncing-ball sing-a-long to "Jingle Bells", and lots more holiday season fun. 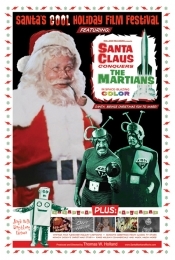 Santa Claus Conquers the Martians is a colorful mix of Christmas comedy and Sixties sci-fi, resulting in an unexpectedly charming "kids eye view" of the holiday season. Filmed on a New York City soundstage in 1964, the cast is made up of top-notch Broadway and soap opera character actors, including John Call as Santa and Bill McCutcheon as an hilariously bumbling Martian. Even the child actors in the film were Broadway veterans and the film's production had to be scheduled around their stage and school schedule. For trivia fans, Santa Claus Conquers the Martians marked the film debut of 10 year-old Pia Zadora who, like all of the Martians, performed in varying degrees of green face make-up. Holland Releasing, distributor of the program, had originally planned a narrow release targeted to college-age audiences who know Santa Claus Conquers the Martians well from its various TV spoofs on shows like Mystery Science Theater 3000 and Elvira's Movie Macabre. However, the film's appeal quickly crossed over to mainstream theater chains who saw the program's huge family and kid-appeal. To date, Santa's Cool Holiday Film Festival is scheduled to play in over 200 theaters with others joining the line-up daily. A listing can be seen at the film's official website: www.SantaMartiansMovie.com. Besides the main feature, the other cool films in this cinematic Christmas stocking are amazing, if not occasionally breathtaking in their Technicolor glory. For instance, the producers have included two rarely seen cartoons from the legendary studios of Max Fleischer, who also gave us Popeye and Betty Boop -- "Christmas Comes But Once A Year", about a grand-fatherly inventor who visits an orphanage to pose as Santa Claus, and "Rudolph the Red-Nosed Reindeer", Fleischer's animated treasure that tells the story of the little reindeer who guides Santa's sleigh on Christmas Eve. The restoration of these gems was costly and time-consuming, but the pay off for the audience is getting to see them as they were originally meant to be enjoyed -- on a huge theater screen. And what's a family movie experience without an old-time sing-a-long? Thomas W. Holland, the producer and director of SANTA'S COOL HOLIDAY FILM FESTIVAL, searched around the world to locate a circa-1949 bouncing ball sing-a-long to 'Jingle Bells.' "I knew this bit of film existed as I recalled seeing on television, in black-and-white, of course, as a kid," said Holland. "After discovering it was originally a segment in an vintage Technicolor cartoon, it took months to locate the only existing print. Its even got extra lyrics that have been long forgotten. Community-sings like this are sadly rare today, but in a movie theater environment, as opposed to television, they bring everyone together. It's a highlight of the whole show." Holland added.